6713 52/68II 2-84 Pfg. 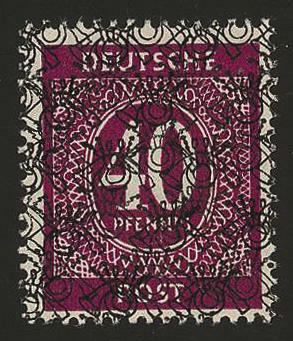 Numeral with net pattern overprint, all 17 values, fresh colors and in perfect condition mint never hinged, expertized Schlegel BPP. Michel 800,- €. 6714 52/68IIDD 2-84 Pfg. 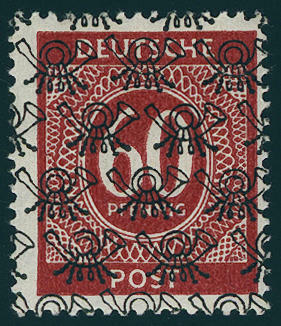 Numerals, all 17 values with double net pattern overprint, as well the 84 Pfg. 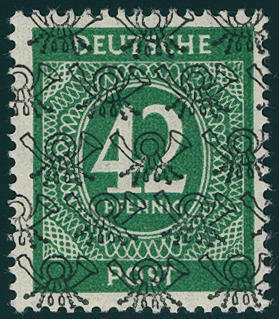 With double overprint, of it one inverted, fresh colors and very well perforated, in perfect condition mint never hinged a scarce set! Photo expertize \"the quality is perfect\" Hans-Dieter Schlegel BPP. Michel 1730,- €. 6715 52/68IIK 2-84 Pfg. 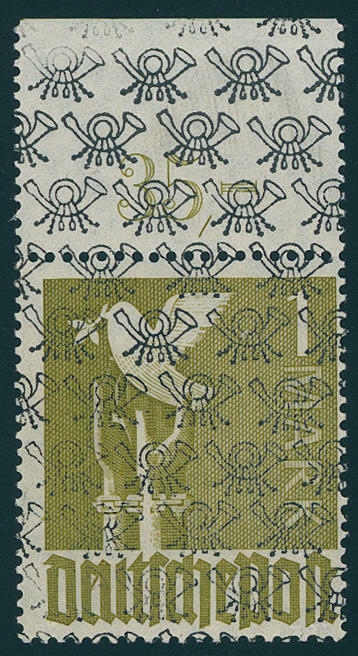 Numerals with inverted net pattern overprint, all 17 values, fresh colors and very well perforated, in perfect condition mint never hinged as well the 40 Pfg. With good double impression, of it one inverted. A scarce set! Photo expertize \"the quality is perfect\" Hans-Dieter Schlegel BPP. Michel 1790,- €. 6716 53Iy 8 Pfg. 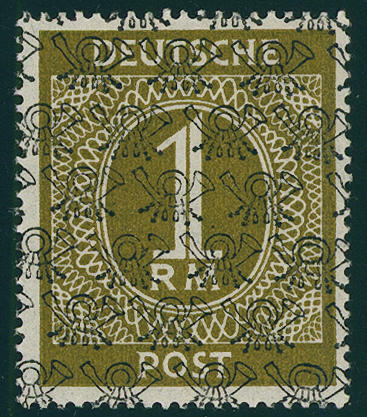 Numeral, overprint, the scarce thin paper, fresh colors and very well perforated, in perfect condition mint never hinged a scarce, nearly always missing issue! Photo expertize Schlegel BPP. Michel 2000,- €. 6717 ⊙ 62IIDD 25 Pfg. 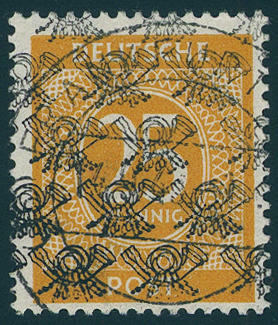 Yellow orange with double net pattern overprint, in perfect condition, centric cancellation \"FRANKFURT\", twice signed Schlegel BPP. Michel 500,- €. 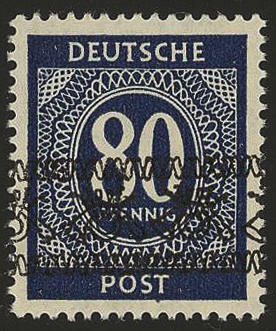 6718 63IIDDPOR 30 Pfg. 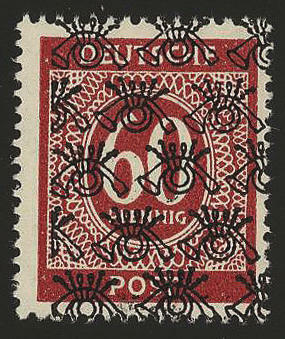 Numeral, upper margin block of four in the plate printing, no perforations going through margins, with double net pattern overprint, in perfect condition mint never hinged in this kind extremely rare. 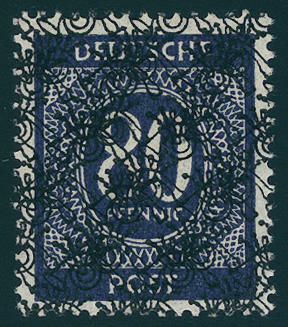 Already the normal block of four without the variety becomes by Michel catalogue with 800,- €listed. In this kind however clearly higher to value! Photo expertize Schlegel BPP. 6719 AI/IIb 1 Mk. 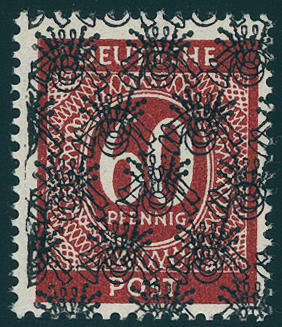 Peace pigeon, strong fluorescing, with net pattern overprint, fresh colors and in perfect condition mint never hinged, a scarce issue, photo expertize Schlegel BPP. 6720 AI/IIbPdgz 1 Mk. 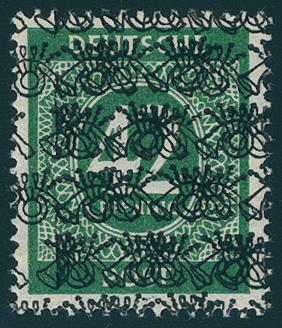 Peace pigeon, strong fluorescing, plate printing with perforations going through upper margin, unfolded, in perfect condition mint never hinged in this kind extraordinarily rare! Photo expertize \"the quality is perfect\" Hans-Dieter Schlegel BPP. Michel 3250,- €. 6721 AIX/II 1 RM. 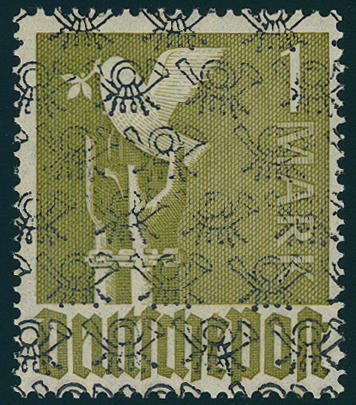 Numeral with net pattern overprint, fresh colors and very well perforated, in perfect condition mint never hinged, photo expertize \"the quality is perfect\" Andrew Schlegel BPP. 6722 AIX/IIy 1 RM. 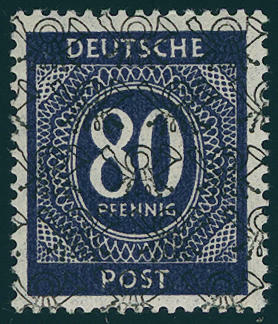 Numerals with rare horizontal gum rippling and net pattern overprint, fresh colors and very well perforated, in perfect condition mint never hinged a nearly always missing issue! Photo expertize Schlegel BPP. Michel 3800,- €. 6723 I-IX/II 1-80 Pfg. 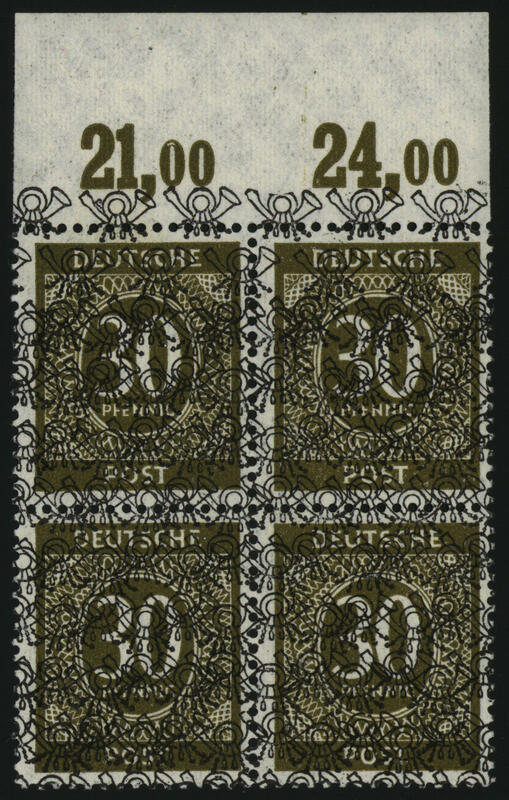 Numeral with net pattern overprint, the nine not issued values complete, fresh colors and very well perforated, in perfect condition mint never hinged, photo expertize \"the quality is perfect\" Hans-Dieter Schlegel BPP. Michel 1200,- €. 6724 I-IX/IIK 1-80 Pfg. 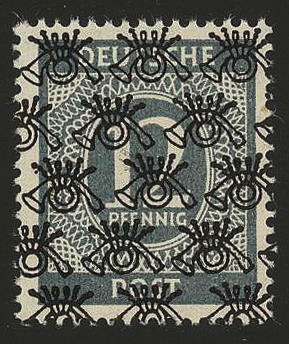 Numerals with inverted net pattern overprint, all nine values fresh colors and very well perforated, in perfect condition mint never hinged, a very scarce set, photo expertize \"the quality is perfect\" Hans-Dieter Schlegel BPP. Michel 1800,- €. 6725 I-IX/IK 1-80 Pfg. 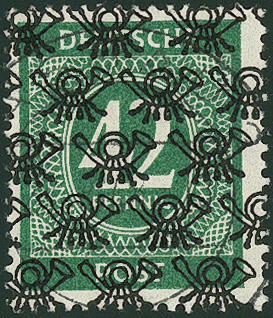 Numerals with inverted overprints type I, all nine values fresh colors and very well perforated, in perfect condition mint never hinged, photo expertize \"the quality is perfect\" Hans-Dieter Schlegel BPP. Michel 1000,- €. 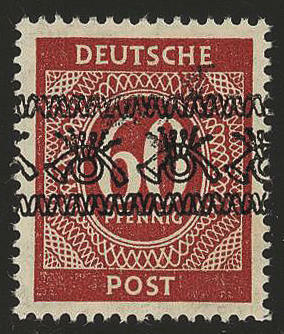 6726 I-IXDD/KD 1-80 Pfg. 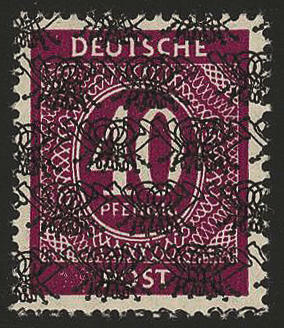 Numeral, the nine not issued values with double overprints, as well the denomination value to 42, 60 and 80 Pfg. 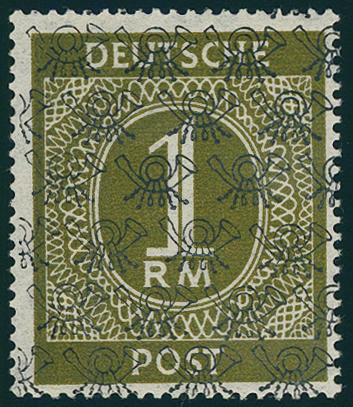 With inverted double overprints, in perfect condition mint never hinged, photo expertize \"the quality is perfect\" Hans-Dieter Schlegel BPP. Michel 3170,- €. 6727 ⊙ VII/II 42 Pfg. 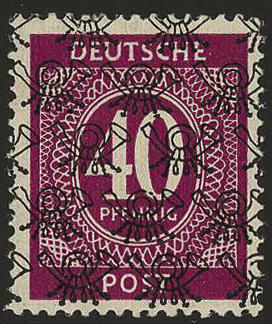 Numeral net pattern overprint, neat cancelled, expertized Schlegel BPP. Michel 1300,- €. 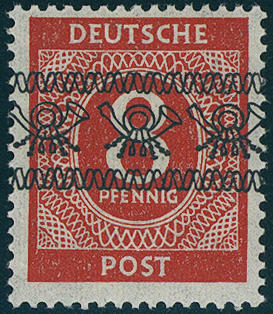 6728 FDC 73/80wg 2 Pfg., 4 Pfg., 5 Pfg., 6 Pfg. 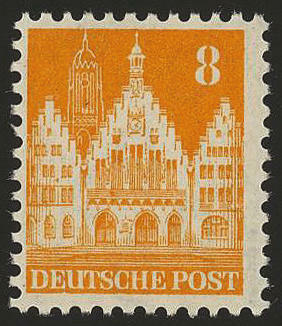 Orange, 8 Pfg. Orange and 10 Pfg. 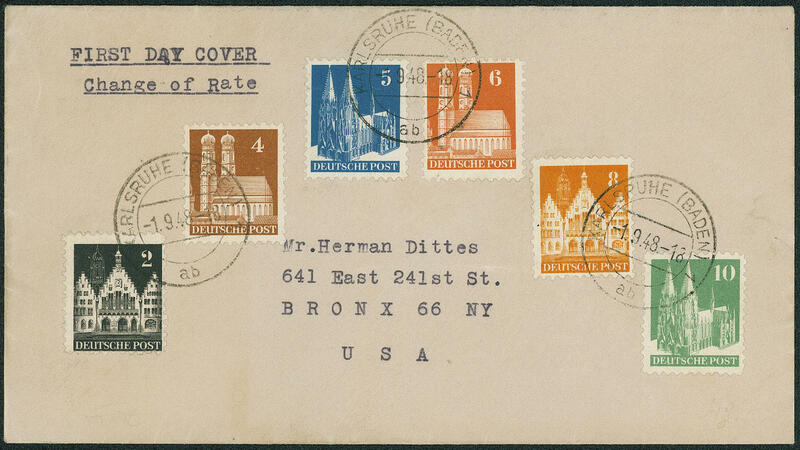 Buildings on very nice, faultless First Day Cover from \"KARLSRUHE 1.9.48\" to New York / USA. 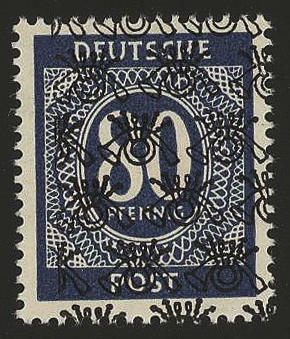 An especially nice and in this kind extremely rare First Day Cover! 6729 ⊙ 73ZF 2 Pfg. 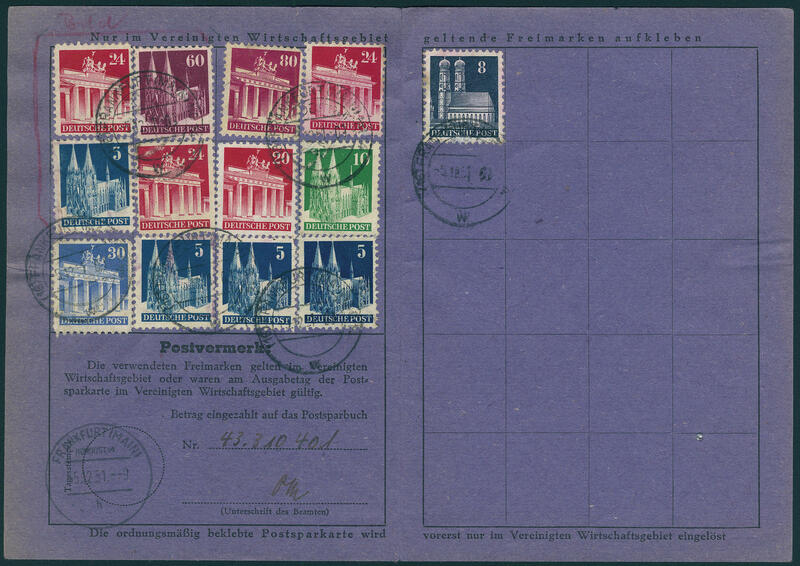 Buildings, perforated K11 1 / 4:11 with scarce watermark Z, fresh colors and neat cancelled \"FRANKFURT\" in perfect condition. 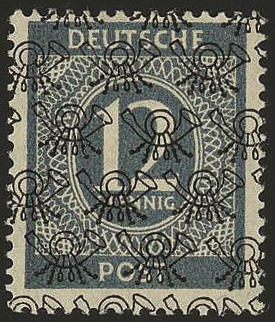 An exception copy of this rare issue! Photo expertize \"perfect quality\" Stemmler BPP. 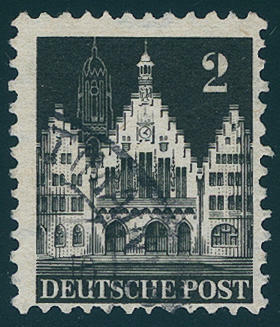 6730 ✉ 75/94ex Complete postal savings card with 13 values the buildings issue, as usual partly small faults, complete franked by in total 3 DM with postmark \"FRANKFURT 5.12.51. \". 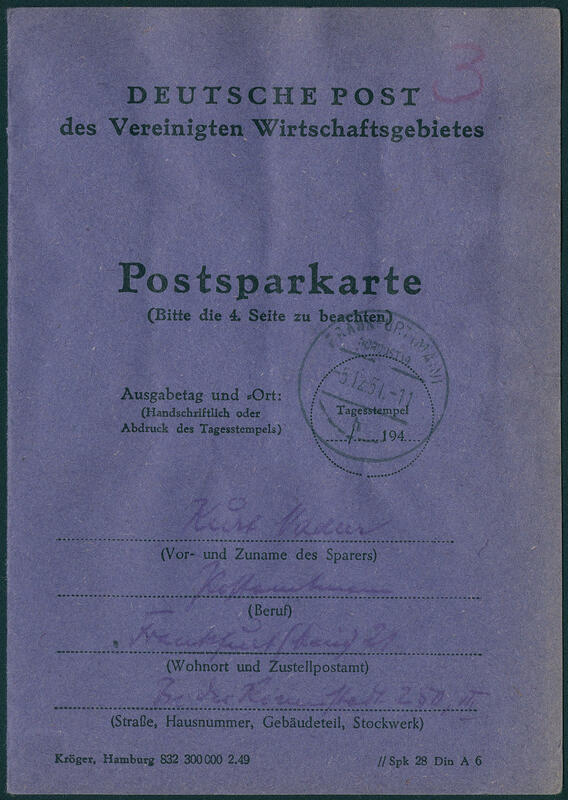 There are only few complete postal savings cards with buildings frankings have become known! 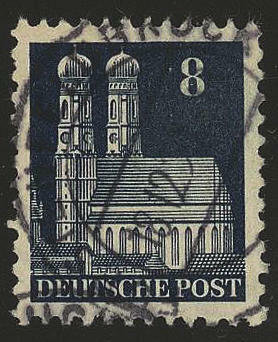 6731 78XF 8 Pfg. Yellowish orange, watermark 1 X, perforated K11 1 / 4:11, field 28 (verso pencil marked), expertized Dr. Wittmann. Michel 300,- €. 6732 ⊙ 79XF 8 Pfg. 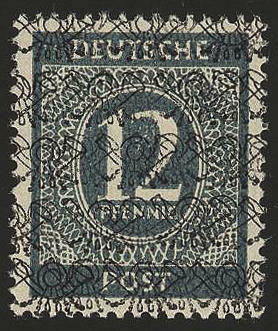 Buildings, watermark 1 X, perforated 11 1 / 4:11, a little irregular perforated, neat cancelled, very rare, expertized Dr. Wittmann. Michel 3000,- €.